There's no doubt that Autumn flowers, fruit & foliage are our favorites here at Little Flower School. Come revel in the best of the season with us Sunday, September 11 at the New York Botanical Garden. We'll start the class with a tour of the gardens and we'll get some special cuttings from the garden to use in our arrangements. In this intensive one day workshop we'll start with a tour of the gardens led by the garden curators of the NYBG! After the tour we'll break for lunch then head inside for a few hours of floral arranging. 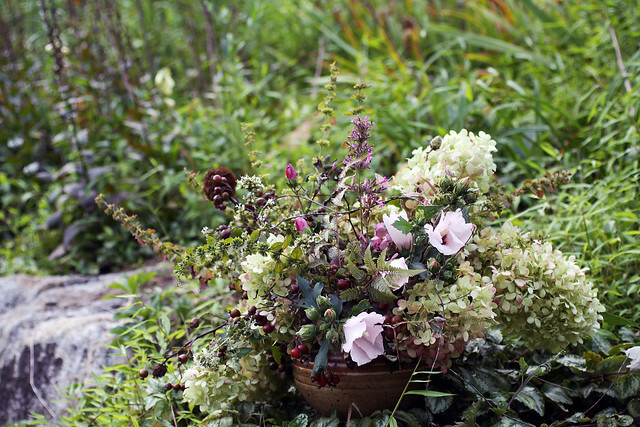 Taking inspiration from the Autumn garden we'll make abundant arrangements that evoke the hues & textures of the season. We'll be using dahlias, pear, amaranth, garden roses, celosia, hydrangea, privet, zinnias, porcelain vine, coleus as well as some very special cuttings from the grounds of the garden!